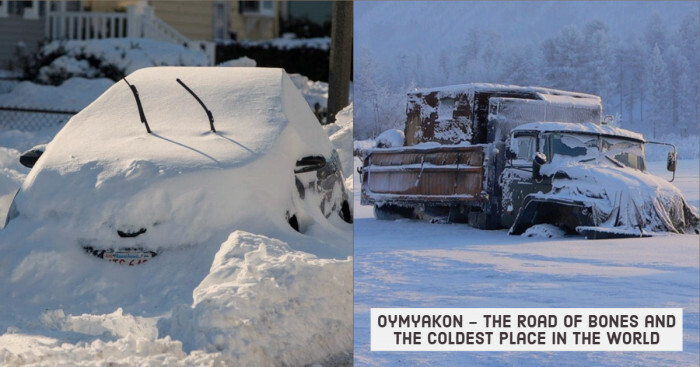 If you think it is cold at the place you are living, then a visit to Oymyakon might change your mind. It is the coldest place in the world where an average temperature stands at -50C. For some countries, the winter season is not just cold, but it’s alarming. It challenges you to survive in the harsh climate. With many coldest places on the earth located in northern latitudes, there is a place with a recording temperature of -83F. If some parts of the world receive high rainfall, then there are also some areas that face a shortage of rains. Likewise, if some parts on the earth are facing hot temperatures, other parts are facing the lowest temperatures. Can you imagine living in an area where the temperature reaches -95F? No! Well, many live and survive in Oymyakon, Russia which is considered the coldest place in the world. 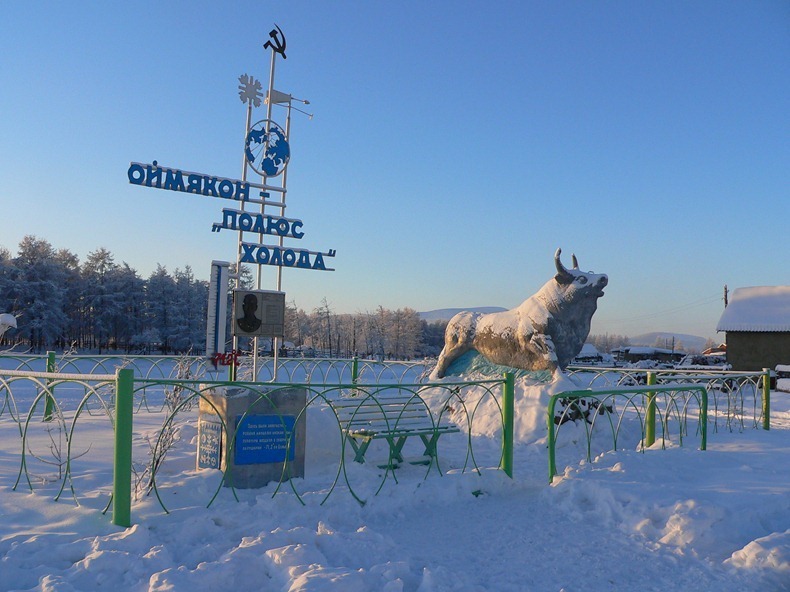 “The Pole of Cold” or Oymyakon is a small town located in northeast Russia, widely referred to as the coldest inhabited town on Earth. The village of Tomtor in the Oymyakon valley is situated around 700 meters above sea level and the length of the day varies from 3 hours in winter to 21 hours in summer. It is home to university, school, and theaters. Do you want to explore more about this coldest inhabited on the earth? Read below and know what is it like to survive in Oymyakon climate. How Oymyakon Residents Live in the Freezing Temperature? When extreme weather in Asia and the US has brought normal life to millions, many inhabited places are still managing to make sub-zero temperatures their routine. Only 500-900 people are living in this coldest inhabited town on earth. Earlier, the village had a population of 2500 inhabitants but that number reduced to 900 in 2018. Today, the village is home to many but has not a single hotel with an outside toilet and hot water. 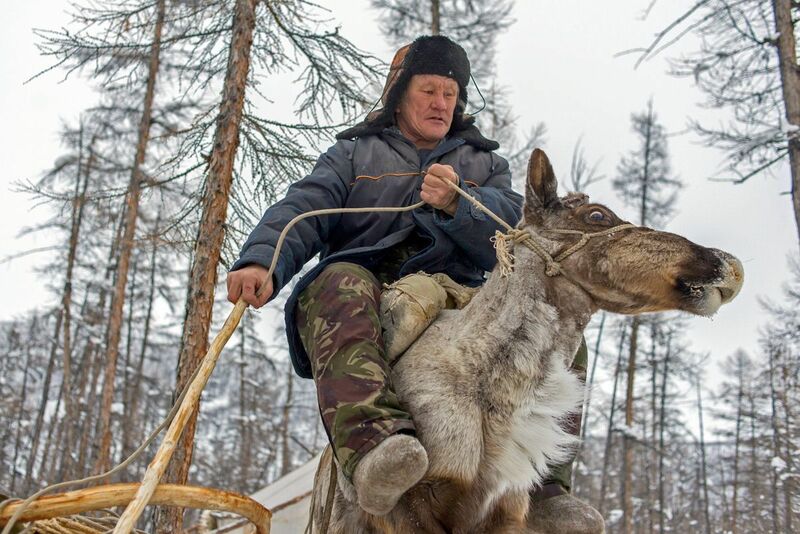 Locals here are unable to grow crops; therefore they consume horse meat and reindeer. 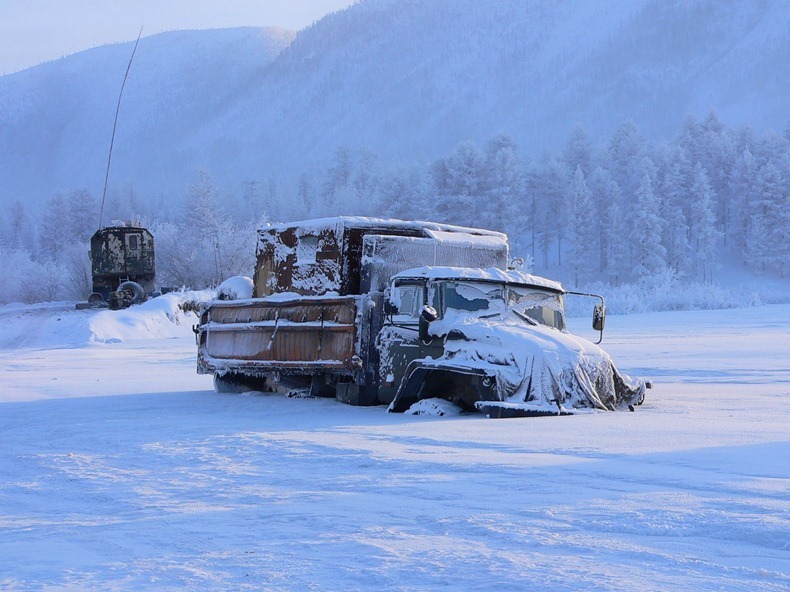 While kids to the south enjoy the snowy days, Oymyakon school closes only when the temperatures fall below 52°C. Perhaps, one of the most difficult tasks faced by people here is within ‘Stalin’s Death Ring.’ Situated in Siberia, an area “Stalin’s Death Ring” has an average winter temperature of -45C with a world record of low of -71.2C. With the ground in a state of permafrost (soil, or rock that is frozen for more than two years), it takes 5-7 days to dig a grave. For digging, the surface first must have been warm enough to dig it, so a bonfire is lit for hours. Then hot coals are then pushed, and a hole few inches deep is dug. The same process is then followed for several days until the hole is deep enough to fit the coffin. While the tourists found Oymyakon an attracting destination because of climate, there is very little to do. It has a shopping area, museums, and theatres. Adventure seekers enjoy reindeer hunts, ice fishing and chilling in freezing temperature. The village was originally a stop for reindeer herders who would water their flocks from the hot spring. Physicians say the reason people don’t suffer from malnutrition is that their animals’ milk is rich in micronutrients. The place is all covered by snow so, do you think there could be some modern conveniences in this coldest city in the world? Well, the village does not provide amenities, but there are some buildings which have outdoor toilets, and people still burn wood for heat. Daily problems that occur while living in Oymyakon is the batteries losing power and pen ink freezing. It is said that people leave their cars “ON” all day long so that batteries do not lose power. Because cars driving in low temperatures must be kept running, the gas stations in the area stay open for 24*7. Workers in the stations work two weeks off, two weeks on. There is no network coverage, and even if did, it is of no use because phones and most electronic appliances do not work at such low temperatures. Fur is the only thing that keeps warm; therefore people love cuddling their pets. Another problem posed by freezing temperature is when the power ceases, the town shuts down for hours and the pipes freeze and crack. The power station in the area burns coal to provide hot water flowing to the homes. If coal deliveries are not done, the station starts burning wood to make climate hot. While the winters in the coldest place on earth are excessively long and cold, the summers are sometimes too hot. Fur is a luxury in the area because it is the only thing that provides heat. There is a short summer season during which locals can grow things, but most people don’t eat vegetables and fruits. They only eat reindeer, white fish, and horse meat. Mostly, they survive on meat soup. However, some regional specialties include Stroganina – a long-sliced frozen fish, frozen horse liver and ice cubes of blood with macaroni. 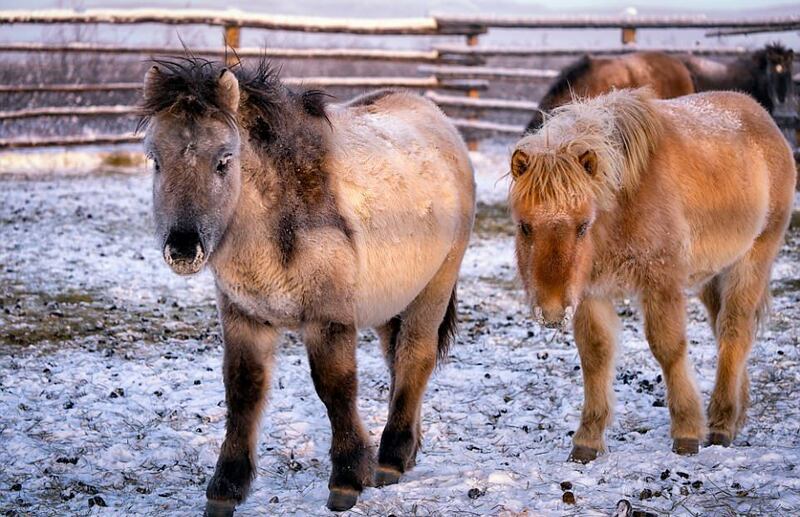 Many animals in the area like Yakutian horses roam semi-wild throughout the years and dig through the snow with their hooves to eat the grass below. Yakutsk sits on the Lena River, but winters here can be so cold that, even the river freeze in a way that it allows the vehicles to drive straight to the other side of the road. Life in Oymyakon is tough. The climate here is dry, but average monthly temperatures are below freezing for 7-8 months of the year. On July 28, 2010, Oymyakon temperature set a record of 34.6°C. Delyankir, Yakutsk (capital city of the Sakha Republic, Russia) and Verkhoyansk are the other places in the world with a temperature higher than 100°C. Some years, the temperature in Oymyakon drops below 32°F in September. Sometimes, the average minimum temperature for December, January and February remain below 50°C. Every year in March festival is organized in the Pole of Cold. The village of Oymyakon after recording a temperature of -71.2C in 1933 was tagged as the ‘The Pole of Cold.’ It unites the travelers from around the world and locals. Russian Ded Moroz of Veliky Ustyug and Santa Claus of Lapland have made their residence there. These heroes also met Yakutian Chys Khan who is referred to as the Pole of Cold Host. During the festival, people showcase the costumes and dance of the native. People also enjoy racing, dog sledding and eat a variety of cuisine. If you are planning to experience Oymyakon weather, here’s how you can travel to this coldest place on earth. It takes nearly two days to drive from Yakutsk down the R504 Kolyma Highway or better known as the ‘Road of Bones’ to reach Oymyakon. The highway was built in the 1930s by Stalin’s prisoners. The journey begins from Yakutsk and heads off up to Magadan and covers three mountain ranges, which creates the unique climate in the area. Yakutsk has many direct flight connections from Moscow and takes 6 hrs 30 minutes to reach the destination. “I remember feeling like the cold was physically gripping my legs. The other surprise was that occasionally my saliva would freeze into needles that would prick my lips”. The camera lens became arduous as the cold temperature was rising. He expected the locals to feel excited to meet strangers. Unfortunately, he found it difficult to meet them. Surprisingly, the word Oymyakon translates to “non-freezing water” due to nearby hot spring. In this area, cold is not a new affair. Although nothing is exciting and happening to do in Oymyakon, it doesn’t stop tourists to visit the place. Several touring companies offer tours to this coldest place in the world. 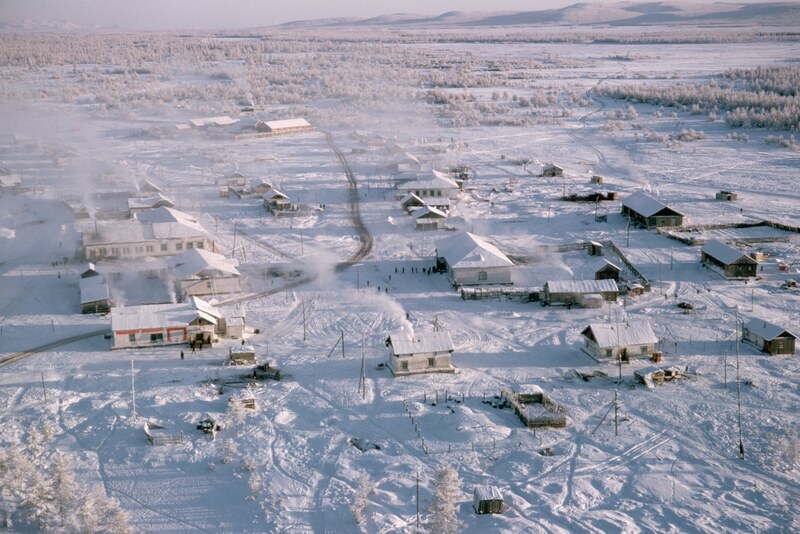 If you ever wished to explore and experience what it’s like to be living in the cold, visit Oymyakon. Surprisingly, there’s also an opportunity to take a dip in hot spring when the temperature reaches -50C. What is the lowest temperature you have lived in? Share your experience and let us know how was it. Yay or Nay?